For leisure pools, in-water seats may be included, offering a relaxing way to stay cool on hot days. When a pool will be used throughout the year, a turbo heater that can increase the water temperature 10º to 15º every 10 minutes may be added. If the homeowners anticipate very active swimming and diving, the depth and slope of a pool is critical to ensure safety for all swimmers. Especially for families with small children, our team takes every step necessary to create a fun and safe environment. We install Coverstar® automatic safety swimming pool covers that give our homeowners the piece of mind and convenience they want. We use top of the line equipment that offers consistent service and manufacturer warranties. And we are very specific about where we place pool equipment so noise and unsightly equipment never interfere with the final design. John Spayde, Landfare Ltd. designer, creates the new outdoor living space using materials that mirror those of the home and other outdoor spaces. 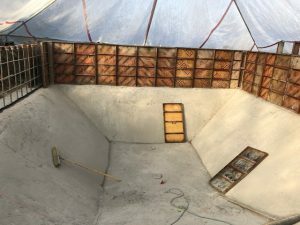 The new pool and spa areas should appear to have been included in the home’s original construction. Classic limestone coping with clip corners and rounded bull nose is often selected to surround the pool when it blends perfectly with the home’s architecture. Timeless design is an important element of every Landfare Ltd. project. There are many options available for pool and spa tiles, including porcelain, marble and glass. Materials, including plaster, and color always reflect the design esthetic of the home and outdoor living spaces. Lighting is important for safety and is also designed to work with surrounding landscaping to create drama and excitement. Additional outdoor spaces, such as a pool house, cabana or play pavilion, can be designed to create a pool area that is a self-contained water and pool entertainment area. A pool house with kitchen, living area and bathroom can keep all the water fun outside of the home. We can even build a laundry area so all those beach towels stay by the pool, where they belong. 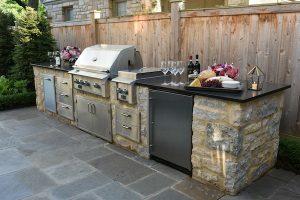 An outdoor kitchen with grill, griddle, refrigerator, sink and bar make poolside entertaining so easy. When the details are all planned, construction can begin. 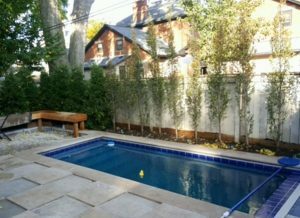 While there are many ways to construct a pool or spa, Landfare Ltd. custom builds to the highest standards to ensure their projects look beautiful, function perfectly and are safe for you and your family. Landfare Ltd. staff have completed numerous training courses through The Association of Pool & Spa Professionals, receiving a Home Improvement Contractor (HIC) License for building swimming pools. This is not a requirement in Ohio but does reflect Landfare Ltd.’s professional approach to all their projects. To build the best you must have a team of highly trained professionals, and Landfare Ltd. invests in the training and education of our staff to offer only the best to our clients. A pool may look very nice when completed but the quality and integrity are built underneath the pool. After digging the hole for the pool, we install a steel rebar floor before pouring concrete. These extra steps create a pool structure that will not shift due to hydrostatic pressure. Not all pool companies do that, but we know that our clients expect us to provide the best product, and we do. Poured concrete walls are 12” thick and finished with Diamond Brite® plaster. Available in many aggregate finishes, this plaster lets us determine the color, brilliance and reflective properties of the pool water. Again, we select every finish to meet the design standards needed to enhance the entire landscape and outdoor living spaces for each home. 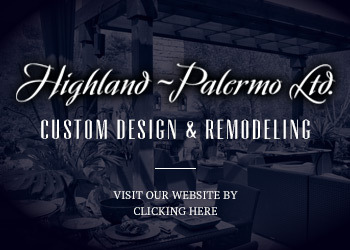 After all the planning, designing and building, our clients can enjoy their outdoor living spaces every day. 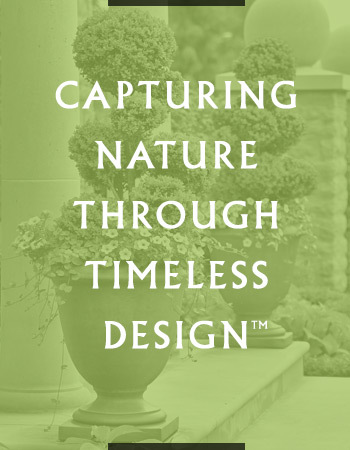 From pools to patios, spas to fireplaces, Landfare Ltd. is committed to creating outdoor entertaining spaces that work with each client’s lifestyle.